Stratton says much of the original electronics and mechanics installed between 1905 and 1916 at the locks of the canal system remain intact. Employees who maintain the canal were honored for their work at the Marriott Syracuse Downtown. Stratton says when you factor in the boats navigating on the canal and the Canalway Trail that spans 80 percent of the state, the canal generates $400 million a year in revenue. "That includes boating, kayaking, powerboats, but it's also cyclists, runners, even snowmobiles in some parts of the state." The canal is also credited with benefiting more than 200 communities across Upstate New York with waterways that cover 524 miles. Stratton says Governor Cuomo has proposed in his State Budget to close a 65 mile gap of the Erie the Canalway Trailn including nine miles in the City of Syracuse. Stratton adds the State Canal System is a direct descendent of Clinton’s Ditch known as ‘the first Erie Canal’ 200 years ago. A celebration will be held this year to mark its bicentennial. The State Canal System consists of four main waterways, the Erie, the Champlain, the Oswego and the Cayuga-Seneca Canals. As of January 1st, the Canal System has a new partner, the New York Power Authority. More information is available on their website at canals.ny.gov. NY State Canal Corporation Director Brian Stratton recognizes canal system workers at the Marriott Syracuse Downtown. The finalists for the "Elevating Erie" project were unveiled at the Erie Canal Museum Thursday Night. These cutting edge designs to transform parts of Syracuse and Dewitt could spark change in city infrastructure. 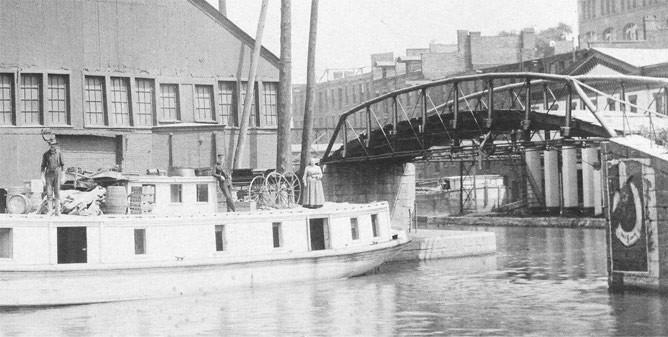 For many people there's little connection between Erie Boulevard and the Erie Canal. But a design competition - and some creative future thinking - are trying to change that. There are a couple of problems here. For one, Erie Boulevard is not as attractive as it might be for shoppers and the businesses that call it home.